Japanese restaurants are among the safer places for vegans to choose when dining out. Miso soup, salad with citrus-ginger dressing, tofu and/or veggie makis, udon, etc… all goodies to choose from. When I’m at work and am craving sushi for lunch, I’m glad that I can hit up Blu Fish Bistro. Blu Fish has a Vegetable Bento for $10 at lunch, which includes your choice of soup or salad. The miso soup is very good: let’s face it. It’s kinda hard to screw up miso soup. If you choose salad, you won’t be sorry. The house dressing is very fresh and tasty. 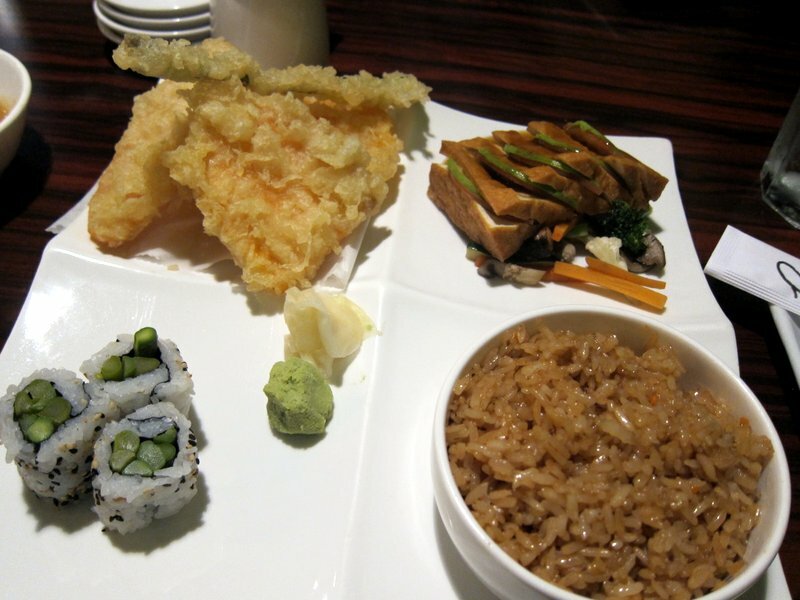 The bento includes veggie tempura (traditional tempura is vegan but egg is sometimes used; ask if you want to be sure), fried rice, your choice of 3-piece mushroom or asparagus roll, and fried tofu with a sweet/spicy sauce served over a bed of vegetables. Unlike most tempura sauces I’ve had, the tempura dipping sauce at blu fish is thick and flavorful. I love it. 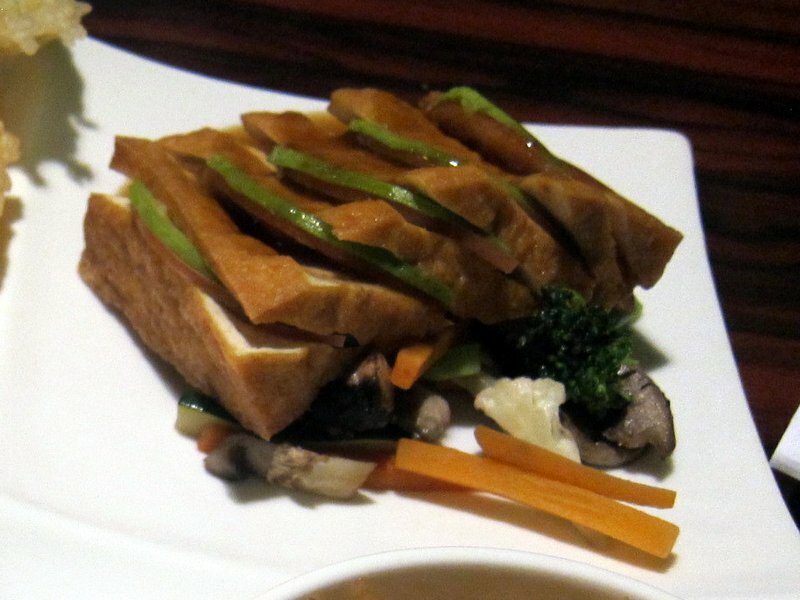 I don’t know what secret sauce they use for the tofu, but it’s perfectly sweet with a little kick. The paper-thin slices of avocado and tomato between the tofu slices are a nice touch. Non-vegans should be happy about the quality of the food and the freshness of the fish. I’ll also say, for the record, that they have one of the best California rolls I’ve ever had. But those were in the pre-vegan days. If we ever go to Blu Fish together, I will watch you eat a California roll. Pssst! Click here to Like Turning Veganese on Facebook! I need that restaurant in my neighborhood! DROOL!